At today logistics demand, our customers require for the tailored made solution in which our expertise and professional team can help you to manage cargo movement and installation throughout the mode of transportation from site to site easily and safety. 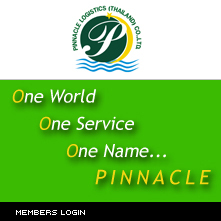 At Pinnacle Logistics (Thailand), our specialized team can take care over size, over dimension cargo with a full array of every kind of equipments and well personnel train staff to code up with it. • Delivery to loading seaports, airports by rail, road, motorway, water way. • Export procedures for shipping out smoothly. • Supervision of cargo loading at origin and at discharge port. • Sea, air, truck for the best mode of transportation. • Transport from discharge port to job side. • Import customs clearance, cargo insurance, transport insurance and third party surveyors.